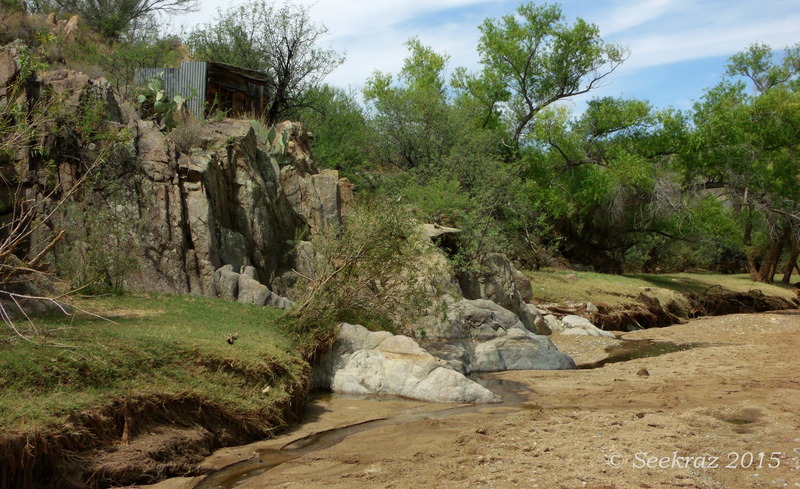 An image from early August of the year past…bounty from summer rains…Agua Fria riverbed…muddy crossing of the Black Canyon Trail. If you remember seeing that ribbon of green in the third-to-last photo, three posts back, this is what it looked like from the inside….a bit of an unusual micro-environment full of fantastic trees, shrubs, and grasses that appeared rather unexpectedly, smack-dab in the middle of the desert. 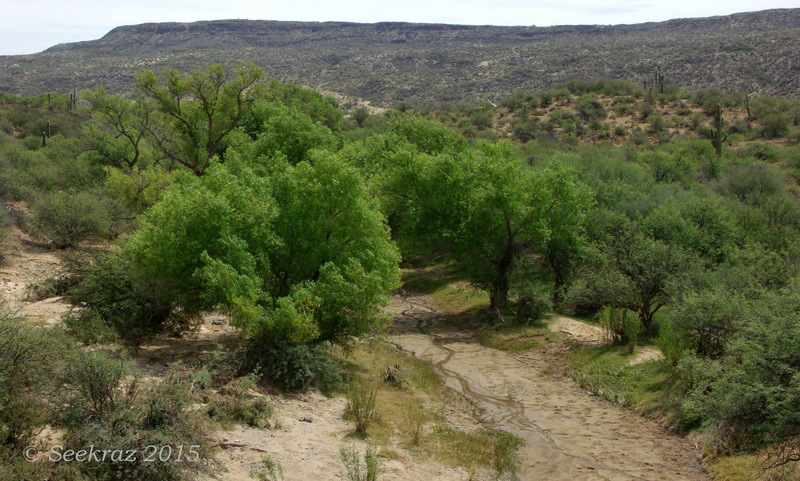 I don’t know the names of most of the larger trees, but there are mesquite and assorted palo-verde on the fringes. 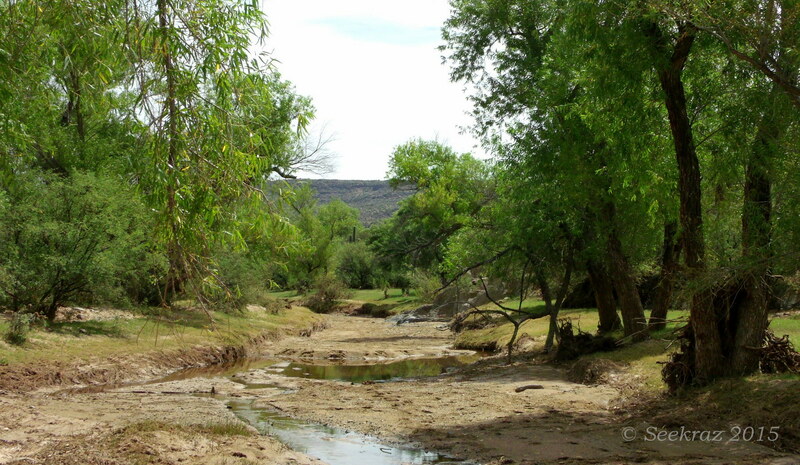 I don’t know the origin of the name of the place, either, but if we were to follow the stream-bed forward, in the above photo, a couple/few miles, we would run into, or at least approach, the proximity of Sheep Gulch Spring…….that’s the way it looks on a map of the area, anyway. 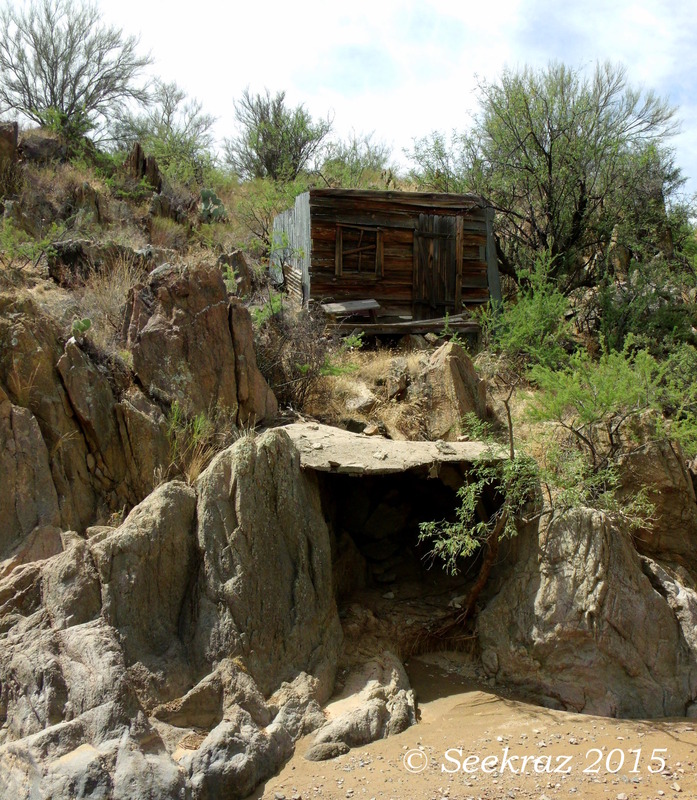 Maybe it’s not a miner’s shack, maybe it belonged to a shepherd, I don’t know…it was just a guess…and quite possibly wrong, as there were none of the other signs indicating that a mine had been dug there….no slag or tailings pile…no water chute…. I didn’t explore the little cave/shaft beneath the shack, either…it seemed rather imprudent at the time, given the poor lighting and the propensity for hidden and biting things to be lurking in such a place…okay, maybe not lurking, but certainly things that had tucked themselves away from the direct sun and would not have been welcoming of my curious bipedal disruption…. 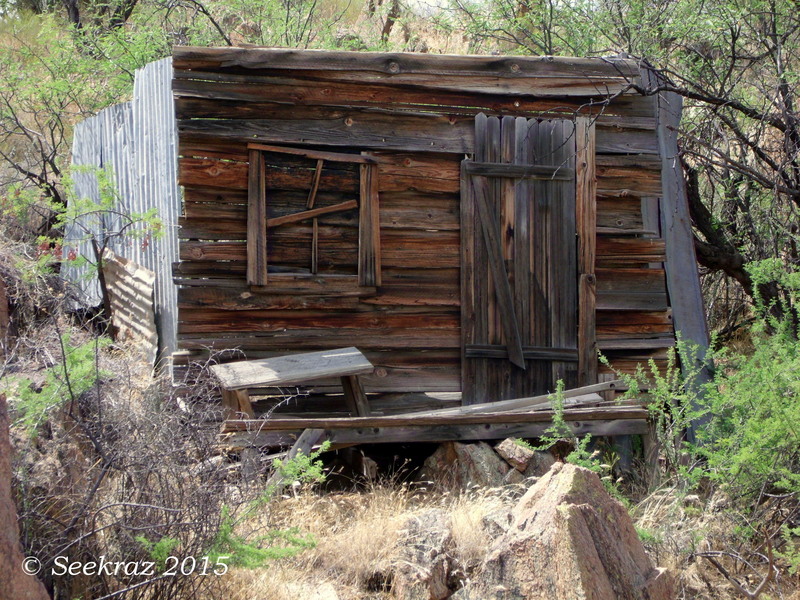 And below is the shack in the context of its surroundings…quite a place to perch one’s self, if you ask me…. 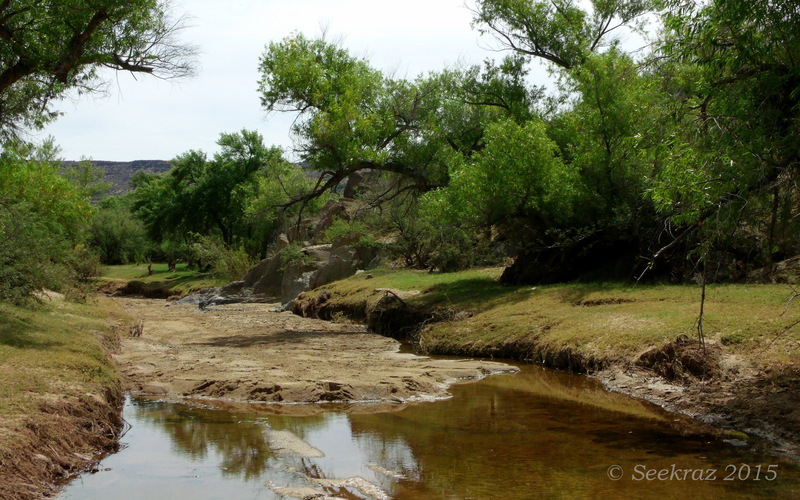 I kept walking upstream a little bit, as I was looking for a soft place to sit in the shade and recoup myself before heading back for the next 2.5 hours hiking to return to the truck. After a quick snack, I headed back toward the main trail, the Black Canyon Trail going south again toward Bumble Bee Road. 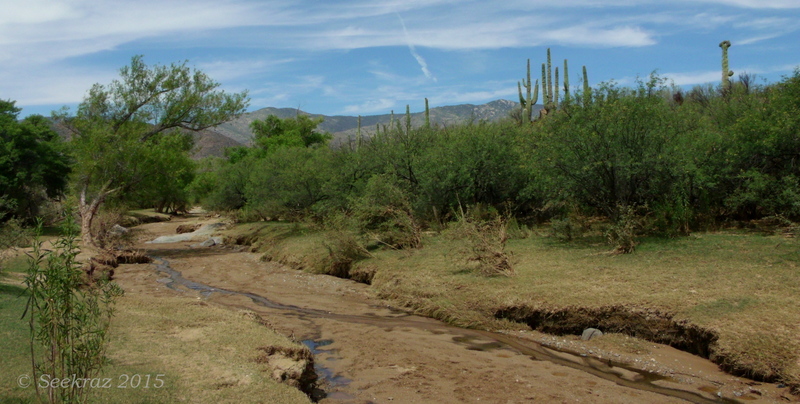 Those are the Bradshaw Mountains in the background of the below photo, and a distinctly misshapen Saguaro in the upper right corner. It looked something like a smashed finger…or perhaps the still-webbed fingers/hand of an embryonic life-form. Lastly, this is the view looking east on the bridge that crosses the stream, and the exact place that has the moniker of Sheep Gulch on the map. I know that some of those trees are cottonwoods, but, as I mentioned earlier, I’m not sure of the majority of the others. 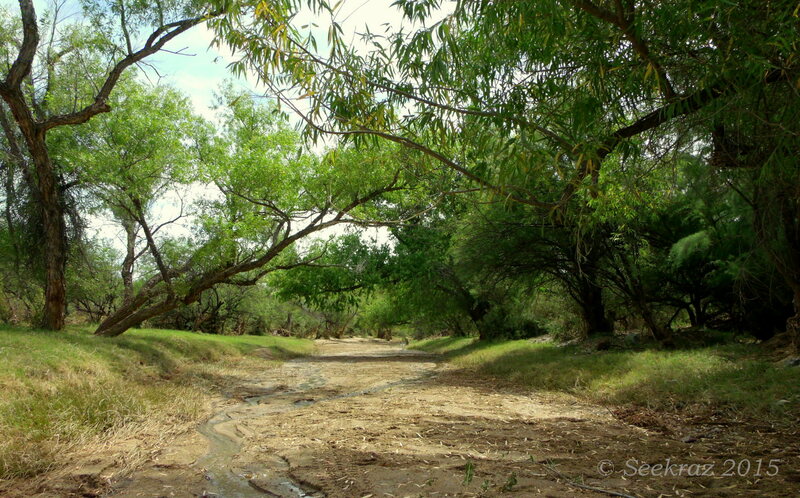 At any rate, they seem to thrive in the stream-beds of this portion of the Sonora Desert…and they cast a beautiful shade during the near-noon portion of the day.